Casa Bella San Miguel, as Seen in NY Times, 4 BR, Beautiful! Casa Bella San Miguel was celebrated by the 'Great Homes' section of the New York Times (see the link to owner's website below). The owner would like to have you enjoy her love of San Miguel by sharing this lovely home when she's away. Why don't you come and see what the good life is all about!! This elegant, yet comfortable, home is located above the hustle and bustle of San Miguel, but not so far as to preclude a leisurely stroll to the central Jardin in 5 to 7 minutes. Laid out around a verdant patio, the home is designed for entertaining, either formally or informally. Immediately upon entering, one ascends a flight of stairs to a welcoming front room with three couches before a fireplace, high beamed ceilings, and informal dining for six. Beyond the table is a bank of french doors that provide a pleasant view and, when the doors are open, a musical splashing of the fountain in the patio. Off this central room are found a large formal dining room with seating for 8 and a fireplace, a study with books and TV, a guest bath and a well-equipped kitchen. Margarita, the housekeeper/cook, has a way of turning out Mexican breakfasts with specialties that will have you raving for months after your visit. Up the well-lit stairway, is a door to the patio, and the first of three bedrooms, containing a queen bed, an interesting 'ojo de buey' (bull's eye) window, a fireplace and bathroom with an antique tub and another fireplace and a street door. Up a few more stairs, one finds the second bedroom, done all in white, and featuring a king bed, a bathroom, a fireplace, and a small sitting room (with Internet access), which opens on to a private balcony with a view to the street and the western horizon. The third bedroom, up a few more stairs, is done in yellow with a green tiled bathroom(with bath tub/shower), and a fireplace, a queen bed with mosquito netting, and a small balcony overlooking the patio below. Up another flight of stairs leads up to the roof garden terrace with table and chairs, potted plants, and a dyamite 360-degree view. The vista features the central cathedral (here called La Parroquia), a jumble of red tiled roofs, houses and greenery to the east, plus a vast view of the lake, rimmed by the Guanajuato mountains and the sunset to the west. The perfect place for a rendezvous of the guests to enjoy a sundowner and to discuss the doings of the day or make plans for an evening on the town. All rooms are artfully decorated with colorful and comfortable furnishings, wall hangings, statues and paintings. The house covers some 3800 sq. ft. on 4 levels plus roof garden. In the center of the home is a gorgeous flowering patio with lounges, chairs and a coffee table. There is garage and a small bedroom and bath (with washing machine) at the main entry level. Margarita comes every weekday (M-F) from 9 AM to 2 PM. She will perform extra chores, such as cooking for you in the evenings, if you desire, for extra pay. Margarita also is in charge of the maintenance of the house, and is on call if you need her at other hours. Cruz, the gardener, comes several times a week to tend to the plants in the patio and roof garden. There is 2 TV with basic cable, as well as a small boom box for radio and CDs, and cable internet. Sorry: no children under 12, no smokers, no pets, Please! 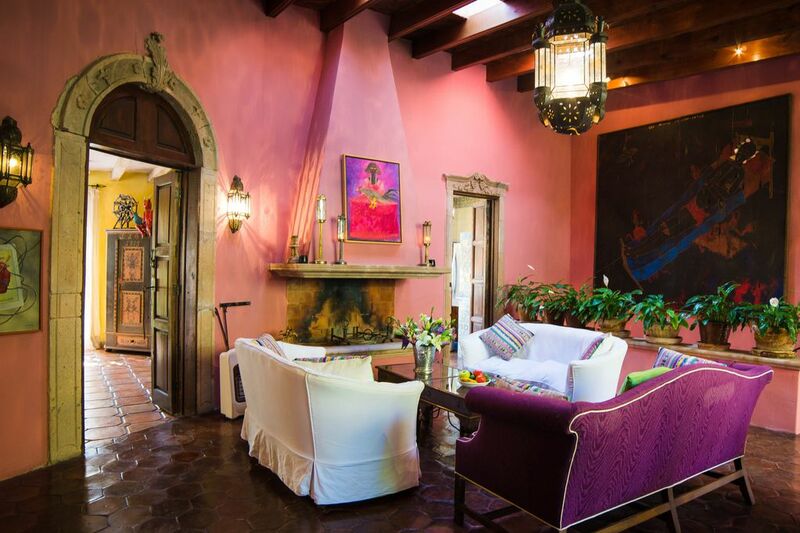 It is a beautiful, well furnished and located house in a quiet yet central location of San Miguel de Allende. The staff is uniquely qualified to assist every visitor. The views from the roof top balcony is wonderful, the gardens mature and lovely. The art and decor are appreciated by all who visit and the housekeeper Margarita is exceptional. Many visitors have called the house magical. Two of the baths have separate tub and showers and one has a combination. The fourth full bath has a walk in shower. There is a 1/2 bath off the living and dining room. The bedrooms have air-conditioning and heating. Heat in public spaces. Wood burning fire place in sala and other 6 fireplaces have gas units in fireplaces, do not use at night when you sleep. Electric blankets and electric heaters. Linens provided with pressed sheets. If you would like your laundry done during your stay please offer to pay her a little extra. 7 although only 1 in main sala is wood burning. 1 car garage has our vehicle in it. If use of a garage is absolutely necessary please let us know and we will try to make other arrangements for ours. The fully enclosed sala with it's 14 foot ceilings is delightful and an adjoining study/library is available as well with a flat screen television. Napkins and placemats available and washed and pressed for guests' use. Plenty of glass, dishes and serving platters of all kinds. Dining for 6 overlooking the garden in the sala or dining for 10 in the more formal dining room. The gardner, Cruz, has been at the house for over 30 years and the patio, roof and balcony gardens are proof of his talent and loving care. There are several, one off the master bedroom (kingsize bed), a small balcony off another guest room and large balcony on the roof tops. There are 3 terraces all with lovely views. Extraodinary downtown views of churches, including La Parraquia and Las Monjas, in one direction, San Antonio in another direction and garden patio as well. A nearby club offers daily, weekly and monthly memberships. Monthly membership available at Rosewood Hotel. Also at Malaquin. Folk and fine art, 6 Fireplaces, basic cable TV, wonderful kitchen and Maid Service five days a week (cooking for extra fee), Gardener, rooftop garden, central patio, views. see casabellaarthomes.com. Casa Bella is beautiful...lots of charm and character. Very cozy and comfortable with outstanding views of the city from the gorgeous terrace. Great being in walking distance to everything. Thank you , we enjoyed having your group . The house is beautiful and very well located. Love the art pieces/paints. Very comfortable. We had a fantastic week in SMA and Casa Bella was a perfect place to stay. The photos of Casa Bella are beautiful but the house is even more impressive. We thoroughly enjoyed our stay in the beautiful, art-filled, well-furnished home. Several of us are foodies who enjoy cooking and the kitchen was well-stocked with equipment and supplies as well as beautiful dishes and glassware. Margarita is a wonderful resource and cook and we delighted in the beautiful flowers throughout the gardens and in unexpected places in the house. I would definitely stay in Casa Bella next time we visit SMA. It is as pretty as the picture! Loved our stay in Casa Bella. It is not only BEAUTIFUL but a very comfortable home. We used all four bedrooms and all were thrilled with their rooms. The majority of our time was spent in the main room in the above photo. It is the perfect atmosphere for entertaining. It opens onto the stunning courtyard with flowers cascading over the magnificent walls. I could rave on and on about how much we all loved the house. I would most def. rent it again. Margarita the Casa manager is lovely.. she prepared dinner for us one afternoon and it was WONDERFUL. Lots of great memories from Casa Bella! Beautiful and comfortable home, amazing views, great location and exceptional host and onsite help! Our family strongly recommends Casa Bella! It was a pleasure to host you and your family ! Please call regarding rates, depending upon last minute availablity further dsicounts may be available.